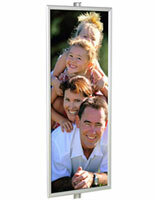 Snap Frames : This snap frame is a double-sided 22" x 28" poster holder! 22" x 56" 24" x 36"
Retail sign frame 22" x 28"
This retail sign frame is a key component in our display accessories line. 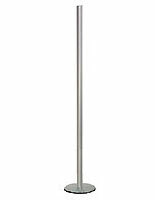 The sign frame, or poster holder, slides on a banner pole that features two adjustable tracks on either side. 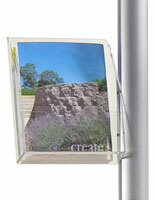 This allows you to feature two sign frames back-to-back on the display pole. A poster holder or sign system like this retail sign holder can accommodate a large advertisement with the remarkable 22" x 28" frame. Note: allow for approximately 1/4" border around your print for the sign frame edges, making the viewable area approximately 21 3/8" x 27 3/8". 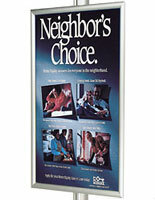 The sign frame, also known as a poster holder, has the popular snap frame design. The snap frame display system, of this sign frame, makes it easy to load and change your retail sign posters quickly and easily. 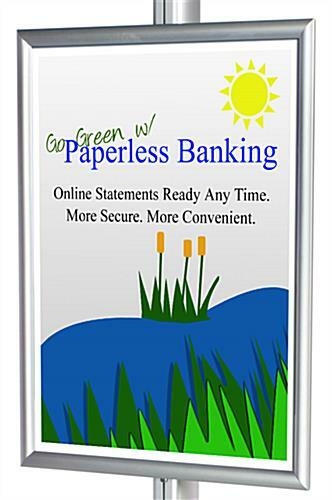 Simply snap open the four sign frame sides, load your retail display poster, and close them again with a "snap". 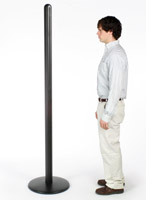 A retail display, sign frame, or poster holder is limited without accessory options. That's why this modular display system product is ideal. The sign frame is just one of the many display accessories available for this line. The many coordinating accessories available make this display system the best choice for your tradeshow display. 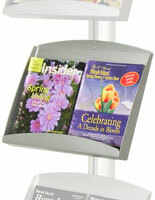 Buy a retail sign frame with literature pockets, and a header for a complete and functional tradeshow display. The accessory configurations are practically endless. A display system product, such as this sign frame, is a perfect addition to any sales floor, or showroom. 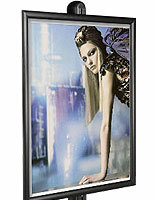 Viewable area: 21 3/8" x 27 3/8"
NOTE: This product is the sign frame only. Visit our line of coordinating display accessories for other products.